Do you like to protect your data and manage all passwords in one place? If yes then here I am introducing you to one app named as PassVult which provide an awesome way of managing your important information. It is the best anti-cloud place where you can store all your data and you will be the only owner of your data. It means the data will be protected in every mean. It is available at the Apple store for iOS users. If you are a businessman or belongs to professional background then this app is useful. 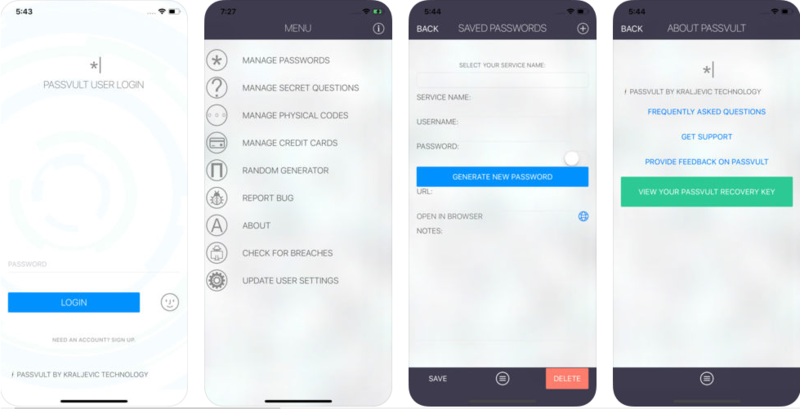 Here you can manage all your passwords in one place and even you can protect those passwords with the help of one master key. I will let you know more features about this app one by one. You can manage your entire password in one place. If you forget your any passwords then don’t worry, just open PassVult and get your password. Other then this you can also store your credit cards information. Its secrete question and answer enable you to have more security. Store the physical codes of your service. Generate your password for your account and secure it. Moreover, the data are stored in the form of Advanced Encryption System in a local database. All of the data and passwords are protected with one master key. It means you will have one single password to protect all your data and passwords. There is breach check feature through which you can check if your email was exposed to any public breaches or not. If you face any kind of issue then you can raise the same through the report bug option. In that, you need to fill the form and you will be reached by supporting team. The app is not providing any backup feature so in case if you delete the app your data will also be lost. Don’t forget your PassVult password as there is no reset option available. You can only change the password after login the app. The price of this app is $2.99 and it is available at Apple Store for iOS. PassVult is a really good app which offers all the useful features. Moreover, it is easy to understand and use. There is nothing important than data protection in today’s technological world so I would like to recommend this app to all my readers.